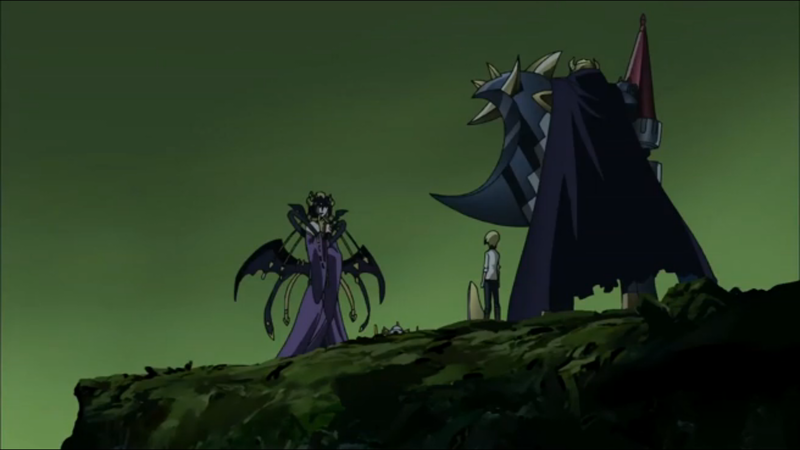 Digimon: System Restore: Fusion Episode 21: Disaster in the Dust Zone! Fusion Episode 21: Disaster in the Dust Zone! In this episode, everybody learns a valuable lesson about how you should never team up with anybody ever because they're all backstabbing monsters. Except Mikey. The wheeling and dealing is coming at a rapid pace now. All four teams are mixing it up, with some pretty massive and/or potent armies all clashing with each other. AxeKnightmon captures Christopher and forces a Blue Flare to re-join Midnight... until Mikey comes along and punches Christopher out of his trance. AxeKnightmon and Laylamon then form a temporarily alliance to defeat the Fusion Fighters, fully intending to betray each other later... until a united Mikey and Christopher wipe the floor with them despite being severely outnumbered. Mikey frees Nene and for a moment all three human generals are fighting together... until Christopher realizes that forming a permanent alliance with Mikey is completely unnecessary. Why? Because he's Mikey. At the start of the series, it seemed like Mikey was a perfect fit for what Digimon Fusion was trying to accomplish. He's as rash and determined as all of the other goggleheads, but with a tactical brilliance that lets him get the most out of the digifuse concept. Now that we're reaching the climax of the first arc, he's dangerously close to becoming a liability. The moments of genius are fleeting, and the creative digifuses are mere sideshows as Shoutmon Xwhatever does almost all of the work. Even up against a horde of Tankmon, Mikey couldn't be bothered to pull out Knightmon or Deputymon (Beelzemon seems to have taken this zone off) for some extra muscle. While Team Blue Flare and the Bagra Army are pulling out everything they have at their disposal and creating some epic showdowns, Mikey is still locked in the mentality of one human, one Digimon. Between Blue Flare's units, Laylamon's Tankmon and AxeKnightmon's skullheads, we've got a hell of a battle here! But rather than roll out the massive army promised to us in Mikey's dream, Shoutmon X4 wastes all comers alone. Save for a few snappy one-liners, Ballistamon and Dorulumon have become little more than accessories to facilitate Shoutmon's evolutions. That's not the team mentality we were hoping for. It's a shame that Mikey and Shoutmon are so conventional in their approach to saving the world. 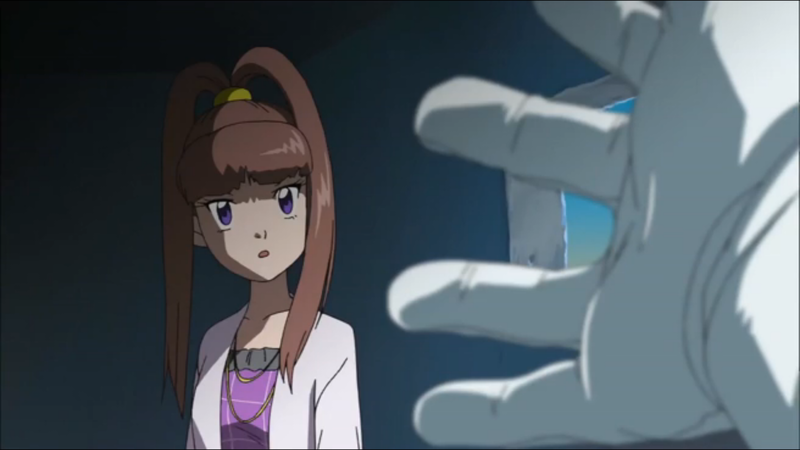 You've got AxeKnightmon manipulating Nene (and now Christopher) for his nefarious purpose. Team Blue Flare will ally with anyone that can help propel them further, no matter how many times they get burned. Even the Bagra Army is increasingly using guile as often as brute force. Why should the Fusion Fighters be above all this? I can appreciate the desire to take the high road and building power by winning over allies through friendship and integrity. Thing is, Dorulumon and now Sparrowmon are the only critical components added that way, and one of them isn't really Mikey's. That can't possibly make up for the potential advantage (and fun) of getting your hands a little dirty. The reaction the other teams have to the Fusion Fighters in this episode says it all. There's no trust whatsoever between AxeKnightmon and Laylamon, but they gladly join forces temporarily to eliminate Mikey. While it shows the respect they have for his power, they consider the move easy, foolproof and doubt Mikey's ability to weasel his way out of it. Afterwards, Christopher doesn't bother forming a permanent alliance because he knows he can come and go any time with no ramifications. Mikey's response is again blunt. In a move out of the Tai playbook, he punches Christopher to knock him out of his funk. In a move out of the Marcus playbook, his ingenious strategy for rescuing Nene involves blowing the door open and dragging her out in broad daylight. The tricky part fell on Nene, as it took a lot of courage to finally break free of AxeKnightmon's control. It's an agonizing decision whether to continue trusting a monster to protect her brother or join someone with integrity in the hope that he'll somehow engineer a way to save Ewan. That, along with everyone else's fights, is what makes the episode work, in spite of Mikey's efforts. Poor Jeremy. The one moment he sticks the landing through the garbage chute (flyboy), a train falls on him. A train that apparently doesn't need to run on rails after all. Laylamon jokes about bringing Devimon in to re-paint Dust Zone into something more cozy. Devimon hasn't appeared in this series, but maybe we now know where the angel painting in season one came from. Speaking of season one, there's a fight between SkullGreymon and MetalGreymon in this episode. It may not be the same MetalGreymon, but surely someone's fanfic just came true. For some reason Nene believes that the Fusion Fighters/Blue Flare tag team beating Midnight/Bagra somehow means that AxeKnightmon is obligated to set Ewan free. Even if that was in the fine print of the Geneva Convention, I doubt AxeKnightmon is beholden to it. Remember the beginning of the show when it's established that Shoutmon needed all the code crowns to unite the Digital World as king? He just gave the (arbitrarily discovered) Dust Zone code crown to Puppetmon... which just sounds like a bad idea no matter what his alignment is this series. 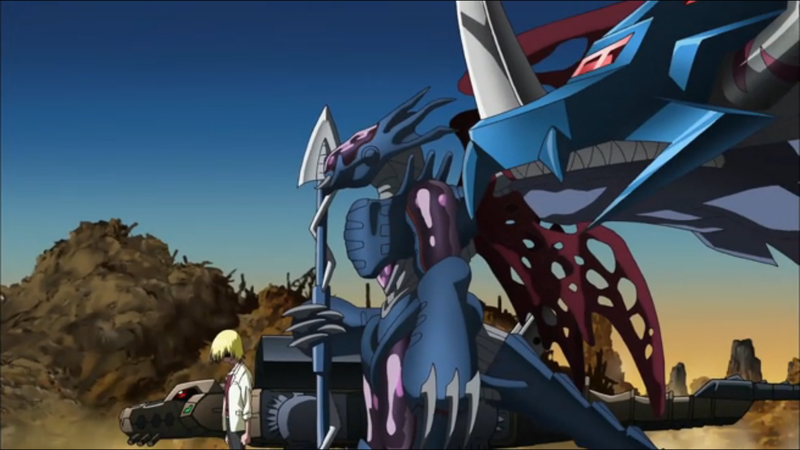 This week's Digimon Data Collection oddity (this is becoming a regular fixture) is that Mikey calls for a closer look at a Digimon he caught. The profile is Stingmon, who only belongs to Lilamon... or Ken. To be honest, I don't think of Mikey as much of a goggle boy. Yes, he does have a lot of determination, but most of the other goggle boys try to use power over strategy. And, none of them are exactly as smart as Mikey. If you compare Mikey to Davis, there isn't much that they have in common. Oh, he's a gogglehead. I'd say the three criteria are endless determination, becoming de facto team leader, and some measure of idiocy. While Mikey is the smartest of the lot and only he and Tai show any knack for strategy (everyone forgets that about Tai), he does throw himself into situations without all the information and resorts to power often enough. All the goggle boys are unique, however (Takato's a completely different breed of idiot, for example), so it's not unusual to find it hard to compare them. Still, if all the other goggle boys had to put their hands on the the Blazing Orb like Mikey did last episode, I'd argue Davis is the only other one who would survive. Do Code Crowns have devolved into such a meaningless plot point. It's basically something that just shows up to determine when it's time to change the scenery. Christopher got a Code Crown in the Jungle zone, the first time anyone else was seen winning one. Why should we care? Why should we care that Mikey just hands his newest one over to the locals? How does it actually affect anything? They're not really controlling the territories if they just scarper off to the next one immediately. They're not even serving to give an indication of how powerful each army is. If they were, Mikey wouldn't be universally winning all of them (except Jungle Zone). AxeKnightmon should have been in possession of the code crown from this area from start to finish and retained it even after this episode to more firmly establish his status as a threat. At least then they'd feel like they mean something. Fusion Episode 20: Train Of Terror! Fusion Episode 19: Rumble in the Jungle Zone!